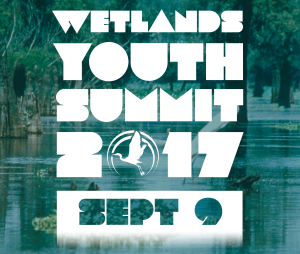 Click here to download a Wetlands Youth Summit registration form. The Wetlands Discovery Center will host the 2017 Wetlands Youth Summit on Saturday, September 9, 2017 from 9:30 a.m. to 2 p.m. at the North Branch Library located at 4130 W Park Ave, Gray, LA 70359. The Wetlands Youth Summit aims to bring young leaders together to discuss the various challenges and potential solutions for gulf coast communities. This program is supported by proceeds from the Rougarou Fest. Registration is free for any high school or college student. Breakfast and lunch will be provided for all participants during the summit. The focus of the 2017 summit will be on Sea Level Rise and Coastal Communities. Workshops will be led by groups from both the public and private sectors. Participants will learn from their peers throughout the day and will take part in an action planning session to address a challenge that is identified as a result of the summit. High school and college students are invited to attend. Please call 985-­580-7289 or email shicks@slwdc.org for more information.